We are pleased to announce the expansion of our New Jersey facility. 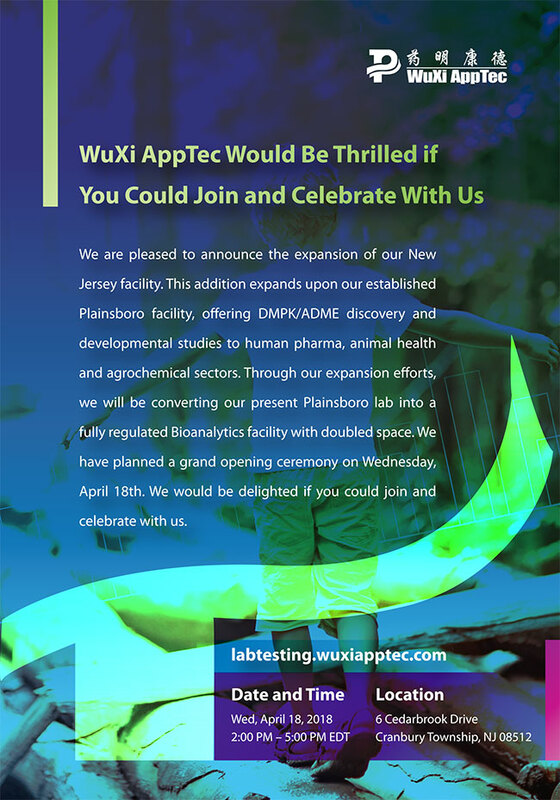 This addition expands upon our established Plainsboro facility, offering DMPK/ADME discovery and developmental studies to human pharma, animal health and agrochemical sectors. Through our expansion efforts, we will be converting our present Plainsboro lab into a fully regulated Bioanalytics facility with doubled space. We have planned a grand opening ceremony on Wednesday, April 18th. We would be delighted if you could join and celebrate with us. WuXi AppTec has continued to build a comprehensive offering through organic growth and acquisition. Its Laboratory Testing Division is poised to play a key role in propelling the open-access capability and technology platform company forward with a full range of integrated testing services. As an organization, WuXi AppTec provides a broad and integrated portfolio of services to help our worldwide customers and partners shorten the discovery and development time and lower the cost of drug and medical device R&D through cost-effective and efficient solutions. WuXi AppTec Laboratory Testing Division has joined DCAT. China is determined to become a larger player in the pharmaceutical market, and offering more opportunities for cross-border collaboration. In terms of cross-border collaboration in the pharmaceutical business, Dr. Francis Tse, CSO of Laboratory Testing Division at WuXi AppTec, said collaboration between the West and emerging markets, specifically China and India, are most noteworthy. "China is determined to be a major player," said Tse, noting the country's new set of drug approval policies. The Chinese government and the China Food and Drug Administration (CFDA) are starting an advisory committee, following an American example, Tse explained. China was also acknowledged as a regulatory member of the International Council for Harmonization of Technical Requirements for Pharmaceuticals for Human Use (ICH) in June of 2017.